Among the list of 47 people presented on Wednesday as "priority objectives" by the Attorney General of the State of Mexico (FGJEM) are involved in crimes such as homicide, femicide, kidnapping and drug dealing, among other crimes. The list includes "plaza leaders" of criminal organizations. For seven people of this "selection", the Committee of Rewards of the institution approved to offer an amount of up to 500,000 pesos for each one for those who provide timely and accurate information to facilitate their prompt location. 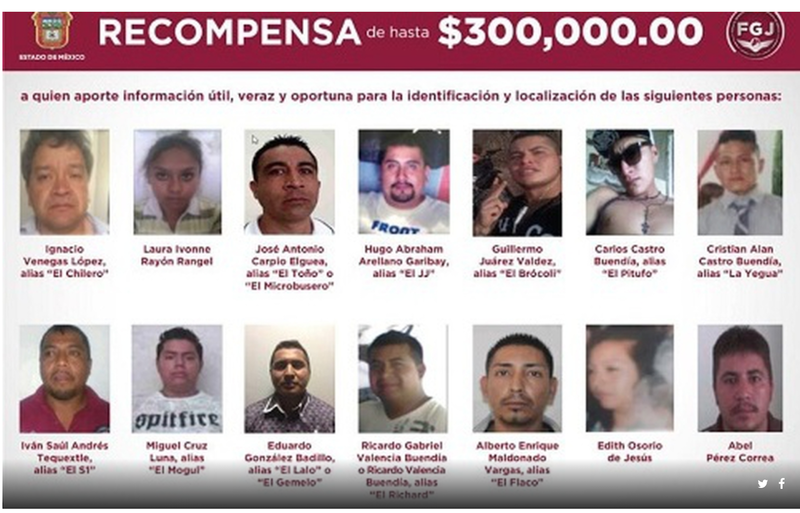 Among them is Gabriel Mendoza Huerta, who is investigated for his probable participation in the crime of qualified homicide, who also has an arrest warrant for the murder of his partner, her daughter and a neighbor; these events occurred in the municipality of Ecatepec, on January 16, 2017, reported to FGJEM through a statement issued in that year. The events took place at around 12:30 am inside the house number 52-B on Avenida Águilas, when the attacker arrived at the house and forcibly entered the home, where he began to verbally and physically attack his ex-wife, Jessica Villanueva, his daughter Rosaria attempted to defend her but the man also hit her, and then shot them both. When the Gabriel Mendoza Huerta came down the stairs, he also shot at a neighbor named Manuel Rodríguez Velasco, approximately 40 years old, who came to the building to try to defend the women. Another of the priority objectives for this agency is Juan de la Cruz Quintero Martínez, alias "El Carnicero" or "El Güero" and one of the most sought-after feminicides in the state. He is accused of murdering Mariana Joselín Valtierra, 16 years old, on July 27, 2017 in the municipality of Ecatepec de Morelos. The aggressor was in the entrance of the butcher shop where he worked and had his charge to take care of it, a place that forced the child to enter and then killed her. Miguel Pérez Santiago, approximately 55 years old, was accused in 2017 of having killed a woman with whom he left a bar. The investigations indicate that the subject took the woman to the municipality of Naucalpan, the body was found on May 8. For these three femicides the FGJEM had already issued the payment of a reward of the same amount for who informed about their whereabouts, however to date they have not been stopped. This list also includes Medardo Hernández Vera, alias "Lalo Mantecas", who is wanted for his alleged responsibility in crimes such as homicide and organized crime, among others. On February 4, assassins of the criminal group "La Familia Michoacana", under the command of Hernández Vera, attacked elements of the Michoacán Police on the Agua Fría-La Guacamaya highway, in the municipality of Tuzantla. 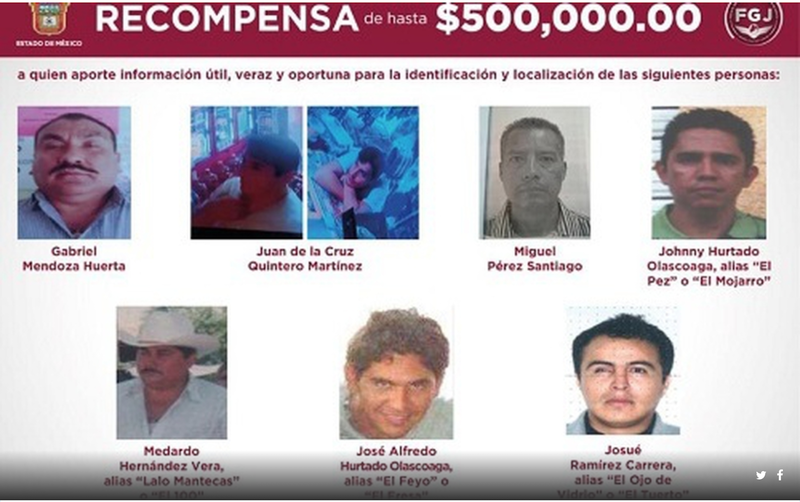 Also on the list are the brothers José Alfredo Hurtado Olascoaga, alias " El Fresa" and Johnny Hurtado Olascoaga, aka "El Pez" for whom since 2014 the agency offers an amount of half a million pesos for each one. 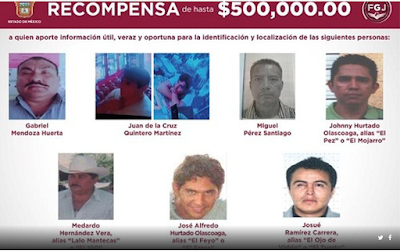 "El Pez" and "El Fresa" are identified as alleged leaders of the Michoacán Family with a place in Amatepec . According to the FGJEM, Johnny has been opened ten folders of investigation, as well as preliminary inquiries in the Attorney General's Office (PGR) and a red file in the Interpol. In addition, it is related to the actions of the soldiers of the 102nd Infantry Battalion, who allegedly extrajudicially executed 10 people in a Tlatlaya winery at dawn on June 30, 2014. Josué Ramírez Cabrera, "El Tuerto", is identified as one of the leaders of the Michoacán Family that operates in the eastern area of ​​the State of Mexico and has gone into the Iztapalapa, Gustavo A. Madero and Iztacalco delegations in the collection of "piso" to merchants and businessmen, besides being related to the distribution of drugs, extortion, kidnapping, lifting and burning of businesses in the municipalities of Nezahualcoyotl, Los Reyes, Chalco, Chalco Valley and Ecatepec. 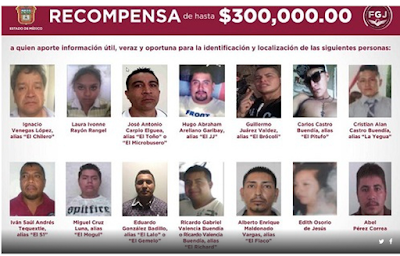 Among the other 40, for whom the individual sum of 300,000 pesos is offered, two women stand out, among them Laura Ivonne Rayón Rangel, accused of the crime of kidnapping and who allegedly in June 2015 had been arrested along with nine other people in the municipality of Ixtapaluca. The other is Edith Osorio de Jesús, from whom no further information has been provided. 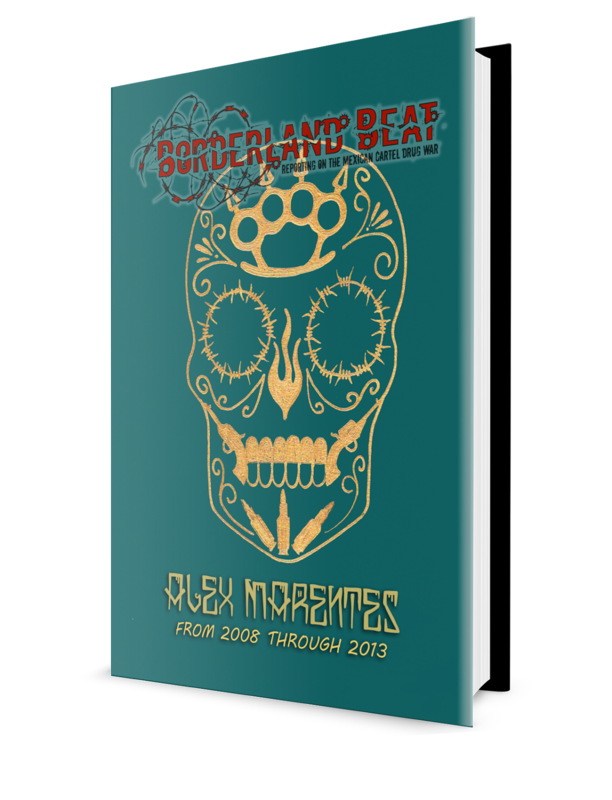 It does not matter concerning most wanted by Mexico....The golden rule is he who has the gold rules....Corruption is to rampant that so many innocents are being murdered and butchered for pennies on the dollar. 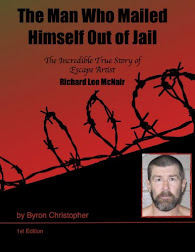 3:01 PM The golden Rule is he who follows the rules that the US government has placed on drug trafficking lasts the longest. These rules are never bite the hand that allows you to live, do as asked and never disobey. Everyone else is confidential until the payments dwindle.